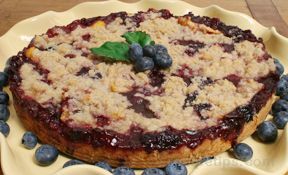 The combination of blueberries and peaches will make this one of your summer time favorites. Place flour, sugar, and baking powder in a medium sized bowl. Add butter and mix until crumbly. Add egg and almond extract. Combine until the dough will form into a ball. With floured hands, press into the bottom of pie pan and partially up the sides of a greased tart pan or pie plate. Wash blueberries and pat dry. Peel, pit, and slice peaches. Combine fruit, lemon juice, and sugar together in a small bowl. In a medium bowl, combine flour, sugar, cinnamon, nutmeg, and butter until crumbly. Sprinkle over tart and bake for 35-40 minutes or until golden brown.